BACKGROUND: Carcinoma of the breast is the second most common malignancy among South African women, its incidence is rising and the mortality rate is significantly higher than in the developed world. Offering quality treatment in a resource-limited environment with poor patient socioeconomic circumstances is an ongoing challenge. Frail health, lack of support in the event of severe toxicity, and the lack of advanced pharmaceuticals, taxane regimens and biologicals limit treatment options for chemotherapy. METHODS: Records of 250 consecutive female patients newly diagnosed with breast cancer from January to October 2008, were retrieved and analysed. Staging at diagnosis, demographic data, histopathology, treatment given, compliance and outcomes were recorded retrospectively. RESULTS: Average follow-up time was 36.2 months, the mean age was 56 years, 205 patients underwent surgery, and 84.4% of patients were fully compliant with therapy. 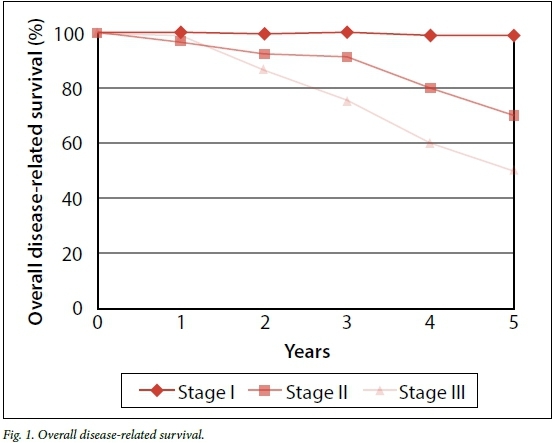 Stage I and stage IV overall survival was similar to developed world figures. Combined stage II/III survival was 64.7%, which is significantly lower than survival figures in the developed world (84.6%). A large proportion of patients (15.7%) with stage II and III breast cancer in our series did not receive chemotherapy. For stage III patients, not a single pathologically complete response was recorded; in stage II complete response rate was 10%. Adjuvant chemotherapy was administered to 41 out of 51 patients (80.3%) with node-negative tumours larger than 2 cm and only 3 out of 14 patients (21.4%) with 1 - 2 cm node-negative tumours. Adjuvant radiotherapy was administered to 83.8% node-positive stage II and 88% stage III patients. Hormonal therapy was administered to 90.7% of the oestrogen receptor positive tumours and 64% of these patients were still taking treatment at time of last follow-up. CONCLUSION: Combined stage II and III disease-related survival in this series was considerably lower than developed world figures. Adjuvant radiotherapy and hormonal therapy were well applied where indicated. The options of neoadjuvant and adjuvant chemotherapy were underutilised in this series - for a large proportion of these patients (10.7%) the reason remains unknown. Administrative error, patient comorbid conditions and patient refusal also contributed to the underutilisation of chemotherapy. Moreover, tumours showed poor response to chemotherapy regimens administered. The emphasis on the expansion of the services to women with breast cancer should concentrate on the extension of medical oncological services to improve outcomes. Biologicals as well as advanced chemotherapeutic options including taxane regimens should be made available. Breast cancer is the most frequent malignancy in women worldwide. The clinicopathological features and incidence differ between African and Western countries, and breast cancer is the second most common cancer among South African women. An estimated 1.38 million new breast cancer cases were diagnosed in 2008 (23% of all cancers), and breast cancer ranks second overall in the world. It affects patients both in developed and developing regions. Incidence rates vary from 19.3 per 100 000 women in southern Africa to 89.7 per 100 000 women in Western Europe, and are high in developed regions of the world and lower in most of the developing regions. It has been predicted that breast cancer incidence in South Africa will have risen by 7% by 2015, whereas in the USA the expected incidence will have risen by 5.5%. Abundant data on the outcomes of breast cancer treatment in Western countries are available, where screening mammography and refinement of therapy have resulted in a rapid reduction in mortality. Breast cancer mortality rates in the USA have decreased in the period 1990 - 2008 by an average of approximately 1.9% annually. In common with other developing countries, the mortality rate of breast cancer in southern Africa is significantly higher than in the developed world. [1,6] Reports on treatment outcomes in developing countries are rare. Limited resources and cost restrictions, and different socioeconomic and cultural environments have also been shown to influence treatment outcomes. We here present a large series of treatment outcomes of breast cancer in a developing country. Records of 250 consecutive female patients newly diagnosed with breast cancer from January to October 2008, in a tertiary centre in a resource-limited environment in Africa, were retrieved and analysed. Demographic data, such as the age of patients as well as stage at diagnosis, histopathological data, treatments administered, compliance and outcomes were recorded. Staging was performed by using the American Joint Committee on Cancer/Tumour-Node-Metastasis staging manual. Surgical treatment administered followed established principles. Adjuvant therapy was administered according to the 'St Gallen guidelines and neoadjuvant therapies according to the National Surgical Adjuvant Breast and Bowel Project (NSABP) protocols B-18 and B-27. While anthracyclin-based chemotherapy was available, taxanes and biologicals were not available due to resource restrictions. Overall survival and relapse rates were calculated according to the method described by Kaplan and Meier. The average age of the patients was 56 years. For clinical characteristics and management of patients, see Table 1. Of the 45 (18%) patients who did not undergo surgery: 1 died of a cerebrovascular accident before admission for surgery, 6 declined surgical treatment, 36 (14.4%) did not have surgical intervention due to the presence of metastatic disease at time of diagnosis, two patients were not offered surgery due to severe comorbid conditions. Fifteen (7.3%) patients had surgery at other hospitals before referral for further management. In 35 patients, histological types other than ductal and lobular carcinoma were present, and 10 (4%) patients' histological types were unknown - 6 of these patients had stage IV disease with only fine-needle aspiration done to confirm the diagnosis, and 4 patients' histology reports were irretrievable. Sixty patients' pathological tumour size was unknown, either due to the fact that no surgery was performed or histology was irretrievable. For a summary of histopathology, see Table 2. For stage II and III disease, 187 patients were to receive chemotherapy. Six (3.2%) patients could not be offered chemotherapy due to severe comorbid disease. Nine (4.8%) patients did not receive chemotherapy due to administrative error. For 20 (10.7%) patients, the reasons for failure to administer or offer chemotherapy remain unknown after thorough scrutiny of medical patients' records. Nine (4.8%) patients refused any chemotherapy. Despite the financial limitations of our practice, no patients were denied chemotherapy for this reason. Eleven (12.6%) patients did not complete their full course of neoadjuvant chemotherapy: 4 patients due to side-effects and 7 patients defaulted. With regard to adjuvant chemotherapy, 2 (4.8%) patients started but absconded before completion and 1 (2.4%) patient did not complete therapy due to an administrative problem. In 78 patients radiation was not indicated. 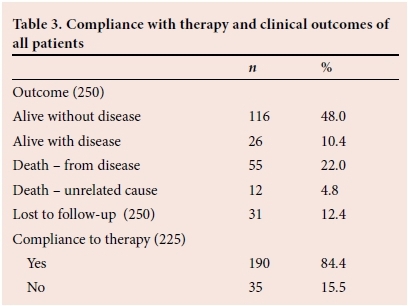 Radiotherapy to the conserved breast was administered to 53 (25.2%) patients, 99 (40%) patients received radiotherapy to the chest wall post mastectomy and 10 patients had radiotherapy for distant disease, 14 patients refused, 1 patient started but then declined due to side-effects and 1 could not undergo radiation for medical reasons. In 51 (20.4%) patients hormonal therapy was not indicated. Treatment was refused by 55 patients and 2 patients stopped treatment due to side-effects of therapy; both these patients had died by the time of last follow-up. Thirty-nine (15.6%) patients died before the scheduled treatment period was completed: 34 (13.6%) died of disease and 5 (2%) of other causes. In the surgical group, 15 patients' histopathological tumour sizes were not available. Ten patients' histology was not available and five had histology, but due to a dendritic response to chemotherapy, pathological size was not measured. Ten patients' histological types were not available. Two of these patients had surgery at other hospitals and histology was irretrievable. Three patients had stage IV disease and no biopsy or surgery was done due to poor general condition. Five patients had surgery at this institution, but histology was irretrievable from the laboratory filing system. For compliance and clinical outcomes, see Tables 3 and 4. Follow-up ranged from 48 to 58 months (average of 36.2 months). At time of last follow-up, 116 (48%) patients were alive and well, 26 (10.4%) patients were alive with disease, 55 (24.4%) patients had died of their disease and 12 (4.8%) of other causes; 31 patients (12.4%) were lost to follow-up. Very few data exist on breast cancer treatment outcomes and survival in developing countries. We compared our 48 -55 months' follow-up data with 5-year survival data from the United States' National Cancer Database. See Fig. 1 for overall disease-related survival. For stages I and IV at the short follow-up time in this series of 3 years, overall survival is similar to figures from the USA for survival at 5 years. Combined stage II and III overall survival was considerably lower at 64.7% versus 84.6% from developed world figures. The mean age in this series was similar in patients with stage II and III disease to ages in the United States' National Cancer Database. Cross et al. performed a literature review of clinical trials and retrospective studies in the USA which compared survival between white women and black women with breast carcinoma after adjustment for known prognostic factors, to assess the impact of race and socioeconomic status on outcomes. The conclusion of this was that poor socioeconomic status as well as black race were associated with poorer outcomes, although it is unknown if these are independent risk factors for a poorer outcome. Black women in the USA presented with more advanced disease and more aggressive tumours. It has also been demonstrated that black women were more likely than white women to be diagnosed after a patient-noted abnormality, and therefore presented more frequently with advanced disease, although this was not demonstrated in our patient group. [13, 14] Younger patients (<36 years) in the USA, have reportedly presented with more advanced and more aggressive disease, and despite aggressive surgical therapy and chemotherapy, had a significantly higher mortality rate.l151 In countries like South Africa and the USA, with a history of institutionalised racism, particular health and medical problems may have a particular prevalence in ethnic groups that were longstanding victims of material deprivation and healthcare inequities. This may lead to social inequalities being incorrectly confused with genetic determinants of a poorer outcome. The majority of the patients (157, 62.8%) were older and over the age of 50 years, which is in keeping with the series from Western countries and may reflect a selection bias in the referral pattern to our institution: younger, working-age patients are more likely to be catered for by private sector institutions. It is commonly recommended that stage II and III breast cancer should be treated with chemotherapy as part of the treatment regimen. Despite this, a large proportion of patients (15.6%) with stage II and III breast cancer in our series did not receive chemotherapy. Six (3.2%) patients were not offered chemotherapy due to comorbid conditions. Nine (4.9%) patients refused chemotherapy. For 20 (10.7%) patients, the reasons for failure to administer or offer chemotherapy remain unknown despite thorough examination of available medical records. These patients may have also refused chemotherapy with no record made of such a decision. No patients were denied chemotherapy for financial reasons. Advanced age with the attendant comorbidities and frail health as well as lack of support in the event of severe toxicity and finally the lack of availability of advanced pharmaceuticals and regimens, such as weekly taxane regimens and biologicals or bone marrow support with Growth Colony Stimulating Factor, limit treatment options. These reasons also hold true for the low proportion of patients who had breast-conserving therapy. Advanced stage at presentation and suboptimal induction therapy limit response rates: for stage III patients, not a single pathologically complete response was recorded; the stage II complete response rate was 10%, where NSABP B-18 reported a complete response rate of 13% with chemotherapy. With biologicals, even higher response rates have been reported. The majority of our patients were non-white and poore response rates have been reported in such populations. 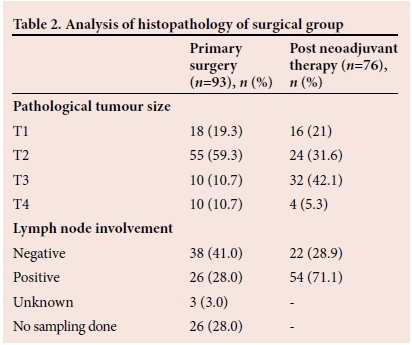 For example, 41 out of 51 (80.3%) patients with node-negative tumours larger than 2 cm and only 3 out of 14 patients (21.4%) with 1 - 2 cm node-negative tumours received adjuvant chemotherapy. Comparing these numbers with St Gallen consensus guidelines, it has to be concluded that the option of adjuvant chemotherapy was underutilised in this series. Compliance with hormonal therapy was good and similar to figures from developed countries, as 119 (64%) patients were still taking therapy at time of last follow-up. Adherence to hormonal therapy in the USA has been found to be 40 - 72%. Evidence of nodal disease involvement was seen in 31 stage II patients' histology. Of these 26 (83.8%) received adjuvant radiotherapy, 2 were lost to follow-up, 1 refused treatment, 2 did not receive treatment due to administrative problems and unknown reasons. Adjuvant radiotherapy was administered to 80 (88.8%) stage III patients while 3 refused, 1 was excluded due to medical comorbidities and 6 patients did not receive radiotherapy for unknown reasons. Adjuvant radiotherapy was well utilised in this group of patients. Save for an earlier diagnosis, as well as improvements with regard to administrative issues and record-keeping, the emphasis on the expansion of the services to women with breast cancer should concentrate on the extension of medical oncological services and chemotherapy to improve outcomes. Biologicals as well as advanced chemot herapeutic options including taxane regimens should be made available.